Ready to move in 2019. With location, lifestyle, design, views, and amenities, it all adds up to 354. 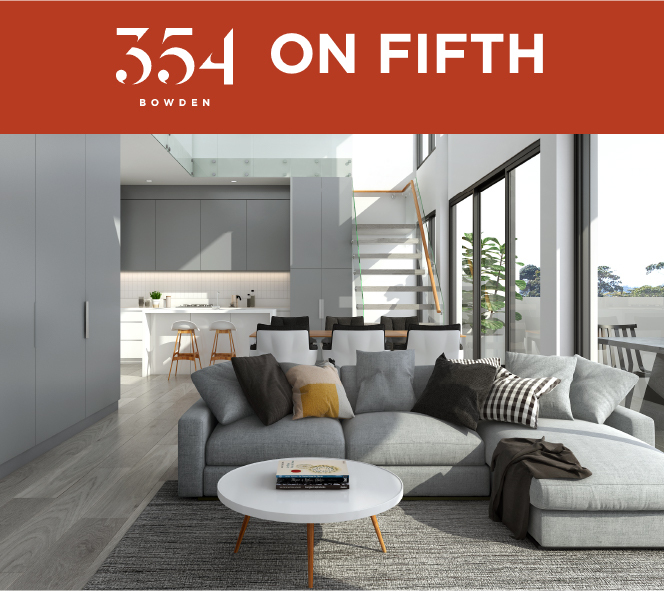 A precinct in itself, 354 represents Bowden’s most inspiring apartment complex, which when completed, will consist of five spectacular buildings. Each building has been meticulously designed to capitalise on their unique locations, aspects, and residential offerings. Your needs will be well and truly catered for at 354, with such a diverse range of homes on offer. Whether you are buying your first home, an investment, or downsizing from your large family home, 354 Bowden has what you are looking for. Bowden has never seen a grander vision for apartment living, until now. 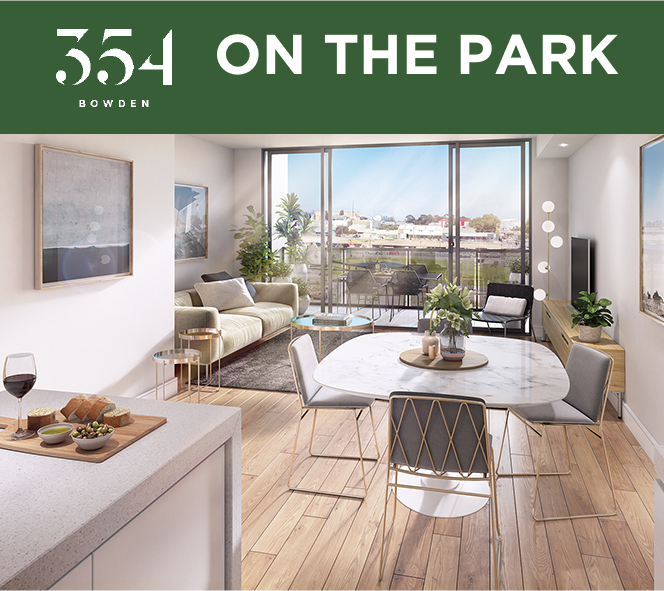 On the Park offers some of Bowden’s best views, of the iconic Town square including a magnificent rooftop garden. On the Lane is home to some of the best boutique apartments. 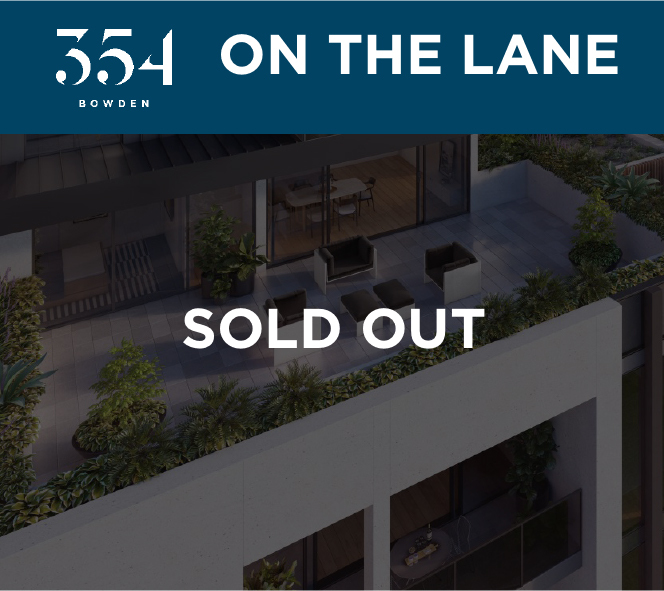 Now completely sold out, On the Lane will commence construction soon. If you would like to view a selection of floor plans for these apartments, please enter your details and a copy will be sent to your nominated email address. Please enter your details to secure your spot at the 354 Bowden SUPER SATURDAY event. Are you seeking the best in urban living and contemporary design? Look no further, 354 Bowden – On The Park East – is now on the market. Register now for updates at www.354bowden.com.au Thanks to Hames Sharley, Life More Interesting and Bowden resident, Anthony.